For a composer who was concerned that his work should safeguard his family’s prosperity, Giuseppe Verdi’s readiness to lock horns with the censors of his day is at first sight something of a conundrum. But Verdi could not write great music unless he himself was moved by the story it was designed to tell. La Traviata is perhaps his most daring opera of all. The authorities’ demands that the action should be set a century in the past to protect genteel taste could not disguise the fact that Verdi was exposing the prejudices of the society he lived in. Violetta makes her way in the world as a courtesan, but falls for a young noble, Alfredo Germont. Alfredo’s father, Giorgio, makes the mistake of judging Violetta on the basis of her profession rather than her character. When she breaks up with Alfredo, it is not for her own good but for the sake of the reputation of her lover’s family. Premiered on 6 March 1853 in Venice at the Gran Teatro La Fenice, and now returning to the Vienna State Opera, La Traviata still resonates with audiences today because its tale is universal. As long as we continue to form our opinions of others based on first impressions, La Traviata will remain relevant whatever era it is set in. Then there is the music. 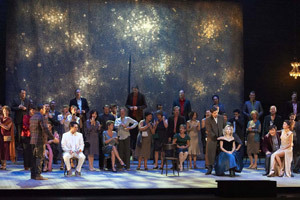 La Traviata marked the culmination of the middle period of Verdi’s career, the point when he had the confidence to fully abandon the conventions of Italian operatic form. In La Traviata, his genius serves not just the drive of the narrative but the development of his characters with melodies attuned to their most intimate feelings.